For some reason thirteen-year-old Nita just cannot bring herself to fight back when Joanne and her crew of bullies comes after her. So Nita gets beaten up - on a regular basis. Week after week she gets black eyes, bruises and scrapes. Week after week she tolerates the treatment, and then one day she takes refuge in the library. In the children?s section she finds a book entitled "So you want to be a wizard" and the next thing she knows Nita is reading the book. She borrows the book and soon she is reading as fast as she can about how to become a bona fide wizard. She takes an oath in which she, among other things, promises to "fight to preserve what grows and ease pain." It isn't long before Nita discovers that as a novice wizard she can now talk to trees. Then she meets Kit, another novice wizard, and the two teenagers become fast friends. Both are lonely and both have their problems. Nita is being bullied, and Kit too is getting beaten up because he has a Spanish accent. They decide that they will try to create a spell which will put a stop to their persecution. What they actually end up doing is they end up summoning up a white hole which they call Fred. Fred becomes a good friend in no time and has an interesting way of looking at things. After this experience Kit and Nita take things easy for a while until Fred accidentally swallows a pen. This has some peculiar side effects on his make up and it is decided that the children need to get him to a worldgate so that the pen can be removed. Unfortunately when they take Fred to the worldgate at Grand Central State in Manhattan nothing goes as expected. The children and Fred are attacked by terrifying creatures called perytons and in desperation they escape through the worldgate and into another dark and terrifying Manhattan. This Manhattan is inhabited by living machines, angry helicopters and taxi cabs that want to kill them, and the children quickly realize that it is going to be challenge just to survive in this place. They also learn that there is a person in this world who is very dangerous and if they are not careful he might escape into their world and turn it into a place of darkness and fear too. In this story of good versus evil readers will find themselves getting swept up in a tale which is a combination of science and magic and which is both intriguing and thoroughly entertaining. 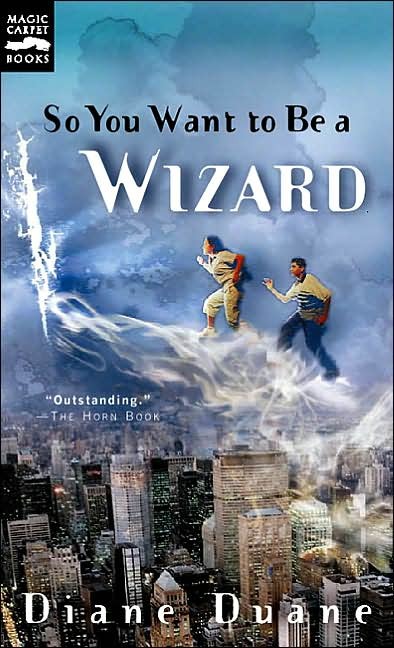 Full of unexpected plot twists and highly colorful characters, fans of science fiction and fantasy titles will be delighted with this first book in the "Young Wizards" series.